The former Italian international could be tempted to return to England. 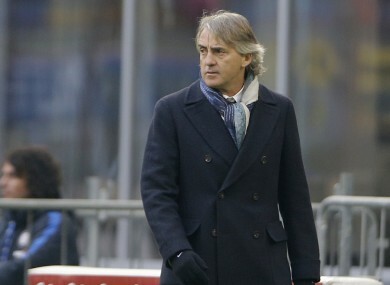 Mancini has managed five club sides in three different countries. INTER MILAN MANAGER Roberto Mancini is reportedly interested in succeeding Roy Hodgson as England manager, according to reports. Mancini, who is in his second spell of managing the Serie A side, won the Premier League and FA Cup during his four-year spell in England with Manchester City. The 51-year-old has only one year remaining on his contract with the Nerazzurri, and further uncertainty surrounds his future at Inter after Chinese investors bought a controlling stake in the club last month. Yesterday, the Football Association revealed a desire to build an England team with a strong identity and stressed that they are not looking for a short-term fix. The FA have already consulted former internationals Gary Lineker, Rio Ferdinand and Frank Lampard, as well as former Tottenham manager Harry Redknapp, on who should replace Hodgson. Sam Allardyce, Jurgen Klinsmann, Arsene Wenger and Glenn Hoddle have all been linked with the job over the past couple of weeks. However, England may opt to have an interim manager in charge when they start their World Cup qualification campaign in Slovakia in September. Should Mancini become the new England manager, he will become the third foreign-born manager of the side, and the second Italian, following on from Fabio Capello. Email “Roberto Mancini ready to throw his name in the hat for England job - reports”. Feedback on “Roberto Mancini ready to throw his name in the hat for England job - reports”.